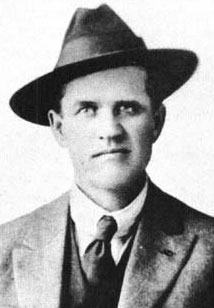 On this date in 1917, Wobbly labor organizer Frank Little was abducted from his hotel and hanged from a railroad trestle in Butte, Montana. An executive board member of the radical Industrial Workers of the World, the half-Cherokee Little had only rolled into Montana’s copper mining hub two weeks before. A roving agitator who had organized workers all around the west, he would be a signal martyr to America’s nascent Red Scare. It was a fraught moment nationwide, and worldwide. After winning re-election on the slogan “He kept us out of war,” Woodrow Wilson upon his inauguration immediately (try to act surprised) got the United States into World War I. Just as it had in Europe, the question of war put American labor to the test: would it transfer opposition to war into resistance, or would it line up patriotically with its state? And Little was one of the most stridently anti-war in his movement. Anaconda Copper could nowise welcome this character’s arrival, where he would organize already-striking miners and mix in militant anti-war rhetoric with incendiary potential in the cocktail of immigrant workers being asked (in many cases) to wage war on their homelands. The local labor conflict, an exceptionally brutal instance of a pattern across the country and especially in western mining country, was probably savage enough on its own to make Little a marked man. Whether his anti-war activity or his union activity motivated his death is not sure, but the dilemma was probably a false one for his killers just as it was for Little himself: they were two heads of the coin. 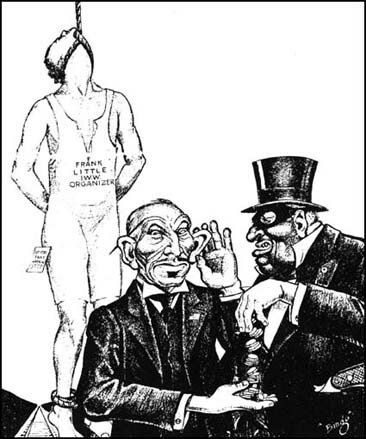 As American troops poured into Europe, and particularly as the Bolshevik Revolution later in 1917 spurred a worldwide Communist scare (and a separate American military expedition), both public and private power violently pursued left-wing elements. This note was found pinned to Little’s body. 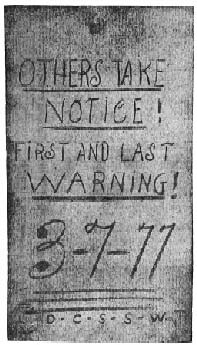 “3-7-77”, a Montana vigilante calling card, indicates the dimensions of a grave. Officially (again, act surprised), it’s an unsolved crime. Even though the New York Times report the day after the hanging quoted a labor official claiming “certain” knowledge of five of the six men in the posse, and a prosecutor vowing, “it is a cold-blooded murder and every effort will be used to apprehend the men who did it,” nobody ever went on trial for lynching Little. Good work! Let them continue to hang every I.W.W. in the state. The time has come. It is beyond the comprehension of the average citizen why the war department has not ordered certain leaders arrested and shot. The people will not stand for much more. A massive funeral turnout brought federal troops to quash labor unrest in Butte … and in the years to come, the IWW would be hunted from pillar to post. Pro-Wobbly sites give adoring biographical treatment and fairly extensive resource lists on Little here and here. Slain By Capitalist Interests For Organizing And Inspiring His Fellow Men. * The AFL, now the AFL-CIO, remains the dominant institution in American labor today. ** Little undoubtedly had in mind the precedent of his fellow-martyr Joe Hill, executed judicially two years before in Utah.